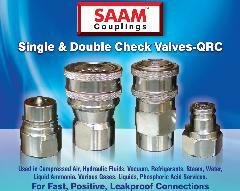 Sep 14,2011 Antech, Pune announces SAAM brand quick release couplings. Antech becomes authorized training provider under MES scheme of Government of India. Antech, Pune announces SAAM brand quick release couplings. This will be manufactured at our fully owned subsidiary at Parvati Industrial estate and will be sold only through distributors. This are manufactured using variety of materials like SS, SS316, SS304, Aluminum, Brass and carbon steel. There are single chuck and double chuck valves and has range of pressure bar it can handle. QRC has wide applications in compressed air, hydraulic fluids, vacuum, refrigerants, steam, water, liquid ammonia and various gases. Industries needs QRC are Fertilizer, chemical, petroleum, furnaces, textile, machine tools and many more. As SAAM couplings will be sold through distributors, antech invites applications from financially and locally strong parties with min 2-3 years industry experience in selling similar products. Antech Micro systems is Pune based company is engaged in CAD CAM DNC and Machine monitoring software from last 20 years. It has more than 2100 installations in India. Antech supports it’s customers with their team of 50 plus engineers and Reseller partners in India and abroad. It also has state of art vocational training institutes in CAD CAM CNC with Production CNC machines for practical exposure to CNC. It also runs free training programs on CNC as well for needy. AR technology antech goup company is Distributor for Siemens Velocity Series products.